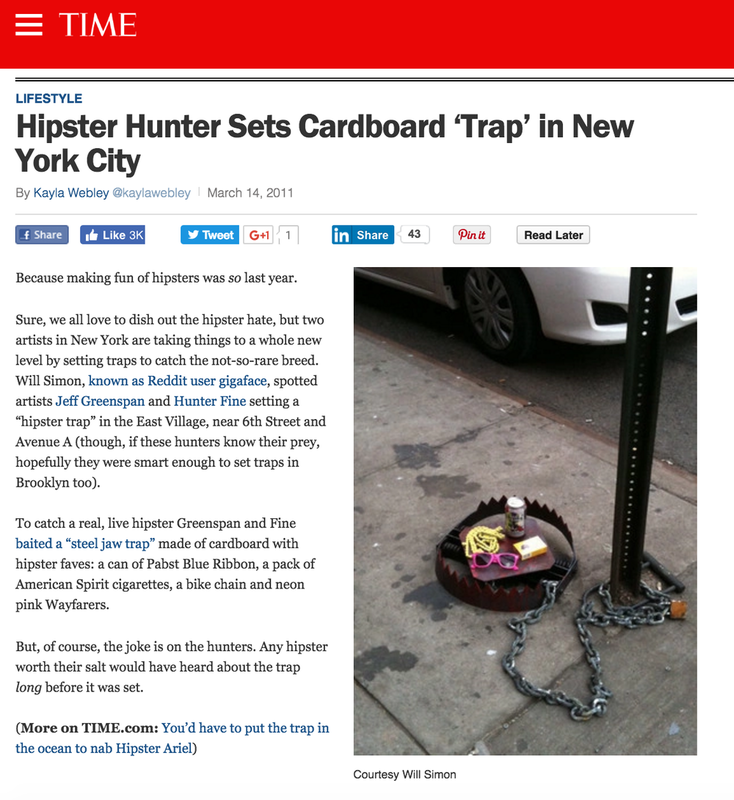 Moments after setting our first "Hipster Trap" (baited with a Pabst Blue Ribbon, neon wayfarer sunglasses, American Spirit cigarettes, and yellow fixie bike chain) in NYC's East Village, a stranger took this picture and posted it online. The next day, our take on gentrification had close to one million views. Williamsburg, Brooklyn - A Holga camera gets added to the bait. They did not take the bait. 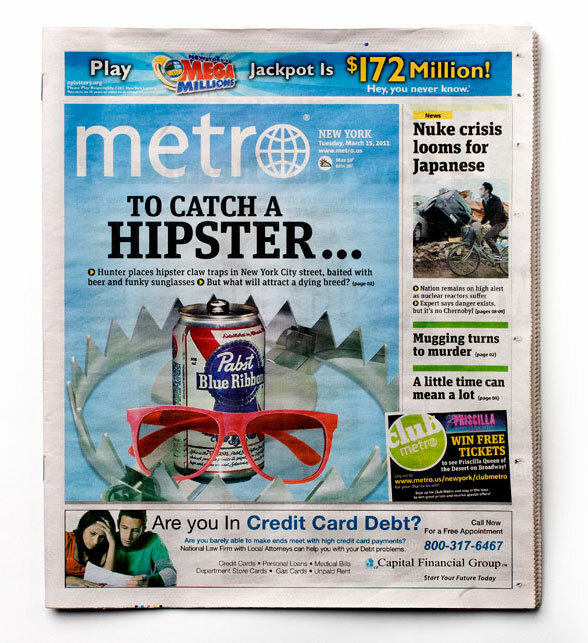 Hipster Trap story makes the front page. We bumped the Japan crisis to the small space? No small children, animals or hipsters were actually hurt. The traps were cardboard. So it was more of a catch and release program. You can see how they were made at UrbanTraps.com. For the particularly loud and offensive outer-borough-ers, we set Bridge and Tunnel traps. This first one was left outside one of their favorite haunts, The Rivington Hotel in NYC’s Lower East Side. The Bait: Drakkar Noir, self tanner, gold necklace, Path train tickets, hair spiking gel, Long Island Railroad schedule. 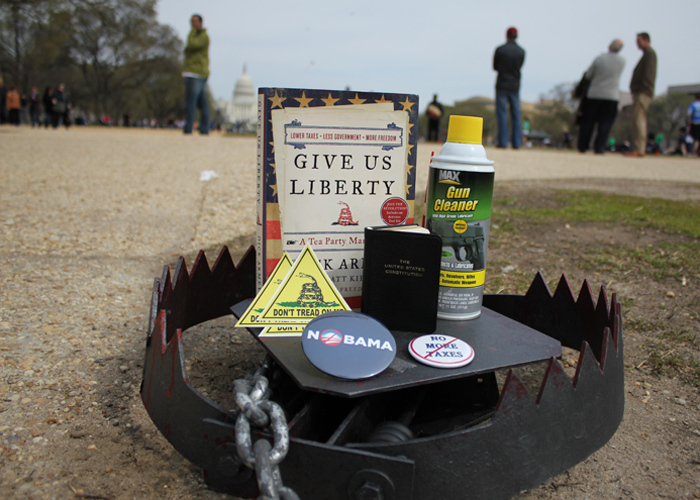 First Tea Party Trap set in front of the White House in Washington D.C.
Bait: Give Us Liberty (Tea Party Manifesto), mini United States Constitution, NoBama button, Don’t Tread On Me stickers. No More Taxes pin, gun cleaner. Near Capitol Building. Washington D.C. In front of Washington Monument. The Mall, Washington D.C.